American Apple Pie – this classic dessert gets a vegan makeover, but tastes just as delicious as the original. Photo Credit: Mary Mattern. Reprinted with permission from Mary and Penguin Random House. Apple picking season is upon us. In fact, it starts here in the midwest where I’m from TODAY! How’s that for timing?! So, head on out to the apple orchard (or grocery store) and pick up some delicious, juicy, tart apples and hurry home to make this homestyle American Apple Pie!! 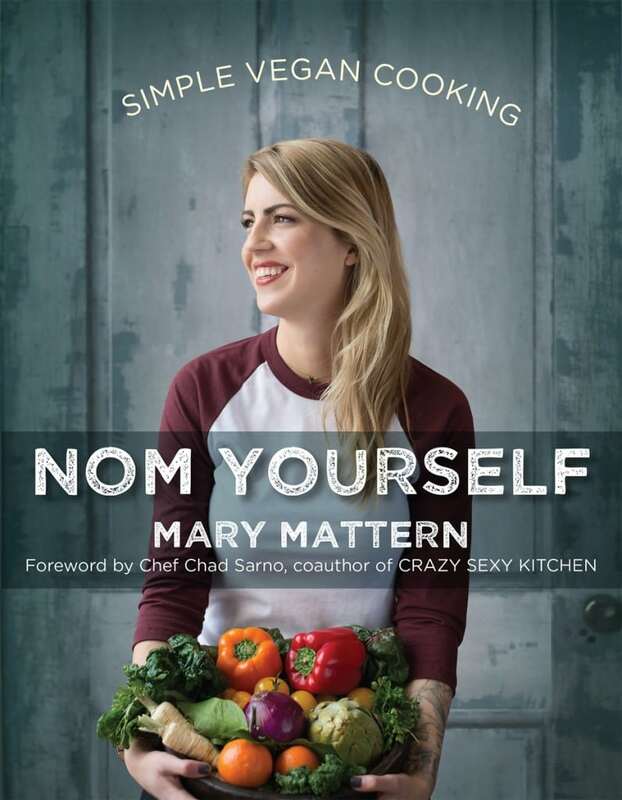 The recipe can be found in the brand new cookbook, Nom Yourself: Simple Vegan Cooking by Mary Mattern. Don’t worry though, you can also find the recipe below right on this very post! But before we get to the recipe and the details on how you can WIN your very own copy of the cookbook, let me tell you why you will WANT this book in your life. First and foremost, Mary is just like you and me. She did not come into this world knowing how to cook and her first trials at it didn’t go well. She was inspired by a family she was nannying for and their weekly trips to the farmers market. Slowly, but surely, she ventured out to try new ingredients and recipes. Even still she found herself sometimes saying, “What the hell is kale and why did I decide to buy five pounds of the stuff?” We’ve all been there, right? Good intentions without a clue how to follow through. Luckily for Mary, and for us, she kept at it and finally succeeded. She also didn’t come into this world a vegan. By creating recipes based on her bounty from the farmers market, she realized she had unintentionally cut out meat and dairy from her diet and was feeling energized. This realization was it for Mary, no looking back! And she decided to share her culinary journey with the world. Drawing inspiration from a bib the little boy she nannied for wore (Nom Nom Nom), Nom Yourself was born. Photo Credit: Nom Yourself by Mary Mattern. Reprinted with permission from Mary and Penguin Random House. I have been following Mary and her Nom Yourself Instagram account for awhile now. The photos of her vibrant vegan food always leave me drooling. Her new cookbook is no different. There are so many scrumptious recipes in there that I had a hard time choosing what to share with you. But, like I said, it’s apple season, so I went for the amazing apple pie. But rest assured, that is only the beginning of deliciousness found in this book. Nom Yourself: Simple Vegan Cooking is broken down into 10 recipe chapters. Are you drooling yet?? Every one of the recipes in the book is dairy free, vegan, and incredibly flavorful. If you aren’t already convinced that plant based food can be exciting and indulgent, you will be after chowing down on Mary’s recipes. She also includes a chapter titled The Essentials. This chapter will teach you how to stock your pantry, fridge and cabinets – with food and equipment – to make vegan cooking a breeze! Need recommendations for dairy alternatives, protein alternatives, sweeteners? Mary’s got you covered. Keep reading to find out how to WIN A COPY of Nom Yourself – it’s super easy to enter. But first, the recipe for American Apple Pie! I hope you love this American Apple Pie as much as we do. If you try it, please come back and leave me a comment below with your feedback. You can also find me on social media. Be sure to tag @veggie_inspired and #veggieinspired so I’m sure to see it. Enjoy! Mary says, "This is by far my favorite dessert. 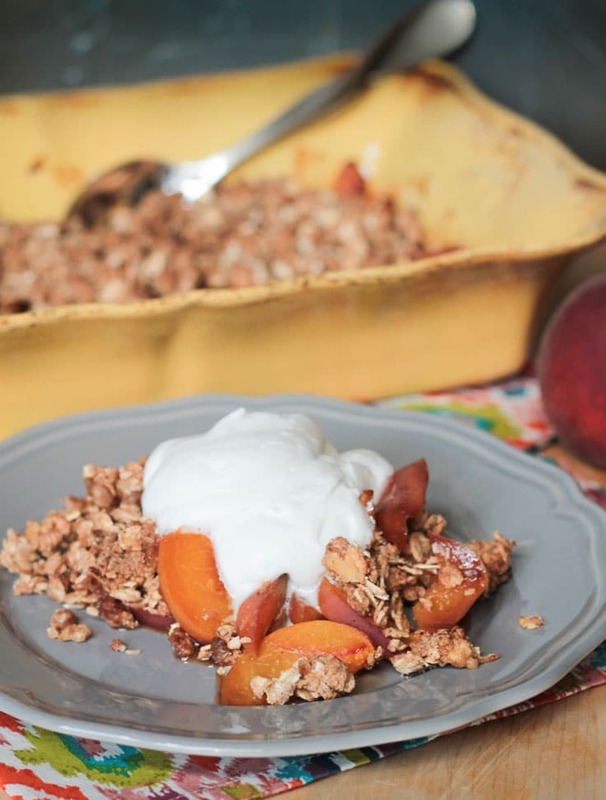 Put a scoop of vanilla coconut ice cream on top and you're are good to go. My grandmother taught me to use thick apples growing up, but I prefer to use thinly sliced apples. It gives you a lighter and more tart-like pie." In a medium bowl, mix the flour and sea salt together. In a large bowl, mix the apples, lemon juice, cinnamon, and brown sugar. Dust an 9-inch pie tin with flour. This will keep the bottom and sides of the crust from sticking. Do not use margarine to grease the tin (it will give you a soft bottom crust). Place the pie crust in the center of the pie tin and push to form the shape of the pie tin. Press the dough evenly so the pie crust is a uniform thickness. You can roll it out as well, but I find shaping it less time-consuming. Cut away any excess dough. Bake for 40 to 50 minutes. Keep an eye on it after 40 minutes to make sure the crust isn't burning. ~When you are cutting the apples, squeeze the lemon juice over them in a bowl to keep them from browning. ~Serve with vanilla coconut ice cream and garnish with fresh mint. *Recipe credit: Mary Mattern. Reprinted with permission from Mary and Penguin Random House. It’s such a classic! What kind are you making, Audrey? This apple pie looks so delicious, Jenn! 🙂 Sounds like a really great cook book! It’s a winner for sure! Thanks, Sina! This apple pie looks delicious! I love finding new and simple vegan recipes! Thanks, Deborah! It really is a very simple recipe…even the pie crust (pie crusts used to scare me!). Good luck! Apple picking was my favorite thing to do in Upstate NY. This is a great recipe for apple pie. I can’t wait to try it. Thanks, Rini! Apple picking is the best! Such a fun family activity! And nothing better than a freshly picked apple straight from the tree! Well, Grandma’s do make the best of everything, right?! This could be your go-to when she’s not around. Thanks, Hauke! Holy crap that pie is gorgeous! I really don’t think that I’d share that beauty. 😉 I follow Nom Yourself IG too. Good stuff! It is just as delicious as it is beautiful!!! I’ve had to hide in a corner reading this because if my husband sees that picture he will be wanting apple pie as soon as! It is his favourite and I haven’t made one since becoming vegan. Now I feel guilty…perhaps I need to make it for him this weekend! Mel, my hubby’s favorite is apple pie too! I have NEVER made a pie in my entire life until this one right here! LOL! I have always been so afraid of making homemade crust. I really don’t know why because it is SOOOO easy! And she actually gives a great tip about just pressing it out into the pie pan instead of rolling and transferring it. Super easy! Definitely try it! I will absolutely be lopoking for this cookbook. It sounds like I want to make everything from the list. Now for that pie! Absolutely gorgeous and you photography is beautiful too. I love a good apple pie recipe, what an added bonus that this is vegan! Such a gorgeous apple pie. I just made one recently but haven’t posted it yet 🙂 Definitely need to try this version out. Great giveaway, Jenn! Can never have too many apple pie recipes!! So so good! Thanks, Vanessa! 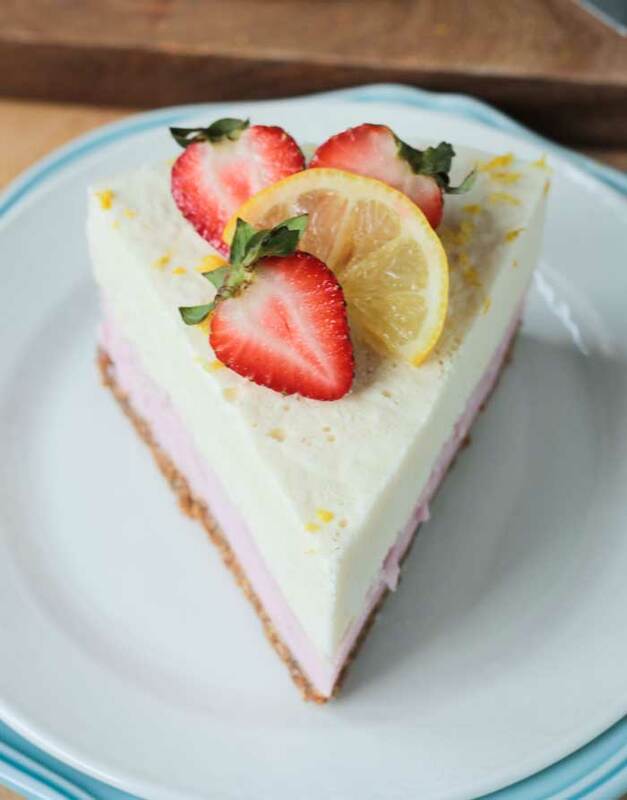 Such a beautiful dessert! I love the cover of her book too!! What a great giveaway. Love her story! Such a great story, right?! Thanks, Brandi! I feel like taking it out of the computer screen and I wish that was possible! Gorgeous looking pie and thanks for sharing! The one thing technology can’t do! Thanks, Madiha! I’d love to win to try out all of the delicious recipes, but I’ll first start out with the pie~! Good choice, Kati! And good luck! gorgeous looking apple pie! can’t wait to try. Thanks for stopping by, Karen! Good luck! Nothing better than a good old fashioned apple pie! Looks delicious! I’d like to win because the recipes sound so yummy! I’d love to win because all of the recipes you mentioned sound delicious!!! I really want to try the Sesame Tofu Tacos. Yes! They sound so good! Those are on my list to try as well. Good luck! Oh this book looks like a must-have! The apple pie is amazing and looks so, so, so good. And the coconut sour cream sounds too good to be true! 🙂 Wonderful giveaway, Jenn! Thanks, Bianca! It really is a delicious book! Good luck! I’d like to win so I can hurry up and try all those great looking recipes! Especially the kale cakes and stuffed shells: they sound soooo yummy! LOL, that sounds like the perfect reason! Everyone seems to be crushing on the kale cakes! Good luck, Piper! I’d love a copy because I’m always looking for ways to expand my diet – and vegan recipes would be a great twist on my usual menu! I’m the same way…always looking for something different. Good luck, Casey! 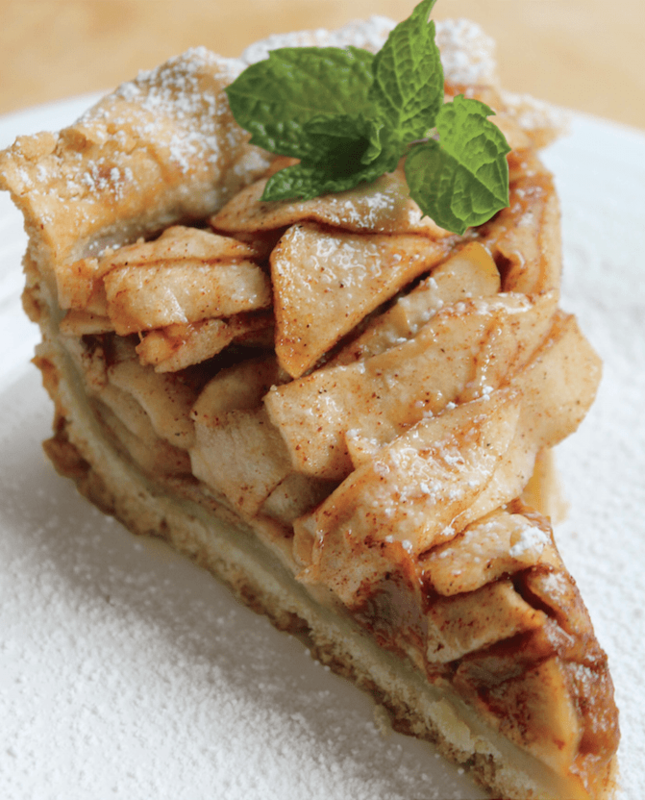 What’s not to love about apple pie – yay! The cookbook looks fantastic! Exactly! A classic American favorite! Thanks for stopping by, Arlene! Good luck! those garlic potato kale cakes you listed above sound soo good! I love to try new recipes ! My daughter and son-in-law are vegan and I’m a vegetarian. Would love to have new recipes to try! Well, then this is the perfect book for you, Priscilla!! Good luck!! Very interested in the cashew cream cheese! It’s a good one, Lia!! Good luck! I want to win because there are a lot of nom-y sounding recipes: Garlic Potato Kale Cakes, Shitake Mushroom Po’Boy with Remoulade… Oh boy I wouldn’t know where to start!!! Thanks, Katie! I have my eye on that Po’Boy too!! Apple season is kinda the greatest! 😉 I can finally enjoy my favorite food at it’s peak! That breakfast chapter~ Gingerbread French Toast and Snickerdoodle Banana bites 😉 O yes! I’m always looking for tasty healthy recipes to add to my arsenal! Always a good thing! Thanks for stopping by! I LOVE apple season too! Sipping on warm apple cider while picking the freshest most juiciest apples straight from the tree. LOVE IT!! I will definitely be trying that Gingerbread French Toast too!